Until 802 the Khmers were organized into a number of warring independent kingdoms. They often fought among themselves and against foreign enemies such as the Chams located in present-day central Vietnam. King Jayavarman I, also named Parameshvara posthumously, united these disparate kingdoms. He first appeared in historical sources in 709. The Khmer empire was to span most of present-day Cambodia and had vassal states in parts of Thailand, Laos, and Vietnam. According to text inscribed on a stela (stone or wooden slab) King Jayavarman I originated from Java, though the Malay Peninsula has also been suggested by scholars as a possible place of origin. From his initial base in Indrapura, most likely situated northeast of Phnom Penh, he launched attacks across the Mekong and on Sambhrapura, Wat Phu, and onward to Phnom Kulen, a sacred place for the Khmers, where he settled in 802. At the time it was known as Mahendravaparta. It was here that the sacred rites were performed on Jayavarman by Brahmin priests of the Shivaite sect proclaiming him the universal monarch of the world, or chakaravartin, a rite based on Hindu tradition from India. The system of dynastic succession within the Khmer kingdom was highly complex. Both men and women could become rulers. More importantly, kingship was passed through other family members of the same generation rather than to sons upon the death of a ruler, although there was often strong opposition to this. The next king, Jayavarman II, was responsible for laying the spiritual foundations within the Khmer Empire. After the death of Jayavarman II in 834, Jayavarman III succeeded him. Harihalaya became his capital, southeast of Angkor. The civilization of Angkor was unique as it was a mixture of two influences—Indian and Javanese. The second king built many shrines, but the next ruler, Indravarman I, also called Isvaraloka, was credited for contributing the most to the religious environment within the Khmer empire. Indravarman laid the foundations for the now centralized Angkor state. Indravarman II ascended to the throne in 877 and ruled until 889. His period of rule was relatively peaceful, even though he succeeded in extending the borders of the Khmer Empire. An ancestral temple, Preah Ko, was built in the imperial capital of Hariharalaya and was consecrated in 880. It was a shrine consisting of a set of six brick temples dedicated to his ancestors and past kings. The temple is considered a piece of art with beautiful male and female divine figures, structural elements such as colonnades, and other embellishments. Another major building project was the state temple, south of the ancestral temple. This temple, known as Bakong, resembled a stepped pyramid and symbolically was regarded as a mountain. Hindu temples in the Khmer kingdom were often built as mountains as they were seen as earthly representations of the divine mountain, Mount Meru, home of the gods in Hindu mythology. A precursor to the spectacular Angkor Wat and Angkor Thom, the temple had a complex structure and was surrounded by a huge double moat, a feature of Angkor Wat as well. At the same time Indravarman set into place a system of irrigation for cultivated rice fields. Large agricultural projects were undertaken, such as building a huge reservoir. King Yashovarman, who ruled from 889 to 900, established the city of Yasodharapura (also known as Angkor) as the new capital. Between 900 and 1200 Angkor achieved great prominence because of the rise of impressive temples in Angkor, including the famous temple that became known as Angkor Wat. It was built in the 12th century during the reign of Suryavarman II. who ordered it to be built. Suryavarman II, dubbed one of the greatest Khmer kings, was a warrior-king and launched many attacks on the Dai Viet, which was highly resilient and resisted subjugation. Suryavarman had gained the throne through the violent means of killing his great uncle, King Dharanindravarman. 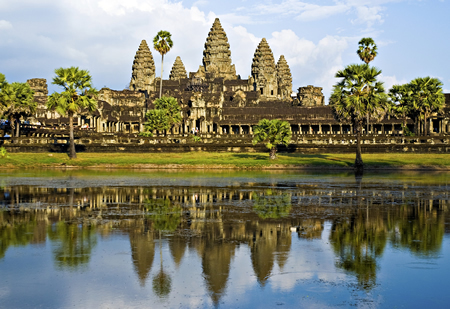 The architecture of Angkor Wat is in classical Khmer style. It was also a temple-mountain surrounded by a wide moat, crossed by a causeway on the east side. The state temple was dedicated to Vishnu, whom Suryavarman II considered the Protector of the Khmer empire, a departure from earlier rulers, who regarded Shiva as the protector of their kingdom. The 11th century witnessed a general rise in Vaisnavite thought in religious and philosophical life in India, and since travel between India and Southeast Asia was frequent, Angkor Wat could have been a reflection of the contemporary trends in Hindu philosophy. The external appearance resembles descriptions of Mount Vaikuntha, home of Vishnu. The city of Angkor Thom was built by another great king, Jayavarman VII, in 1181, after he defeated the Chams who had captured Angkor in 1177. Instead of reclaiming the old Khmer spirituality before the Cham defeat, Jayavarman pursued a course of reinvention. He enacted a major change in the Khmer Empire by replacing Hindu religion with Mahayana Buddhism as the official state religion. The power of the Hindu aristocracy within the empire was seriously undermined. It is said that Jayavarman VII was following the example of Ashoka, the model for all Buddhist rulers. The imposition of Buddhist cosmology led to an extensive reworking of religious, political, and military organization within the Khmer kingdom. Jayavarman VII was responsible for organizing the capital, Angkor Thom, into a mandala, which is a symbol of the universe and its energy. The construction of Angkor Thom, based on this highly regulated pattern, took about a decade. It was an awesome feat as the mandala was extremely difficult to replicate in the form of a city. 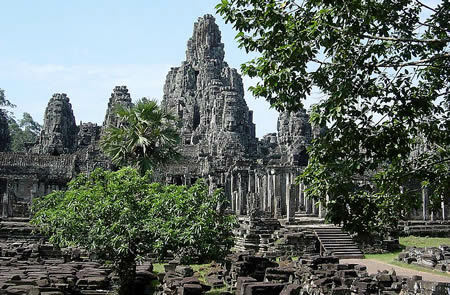 The new capital city was known as Angkor Thom Mahanagara, or simply Angkor Thom. The site of the city coincided with that of an earlier city, Yasodharapura, built more than two centuries before. Right in the middle of the city is the Bayon, the state temple built by King Jayavarman VII, in the exact center of his capital of Angkor Thom. Every road from the city gates leads directly to the Bayon. The Bayon, which was covered in gold and orientated toward the east, according to a Chinese account, was also known as the Assembly Hall of Gods. According to the concept of the mandala, the gods would gather there on certain days. Jayavarman VII was at the peak of his reign, and he assumed supreme rule. The decline of Angkor began soon after Jayavarman’s death. His son, Indravarman II, who ruled from 1219 to 1243, withdrew from many provinces previously conquered from the Champa kingdom. Their neighbouring rivals, the Thais, were also gaining more power, strengthened by the establishment of the kingdom of Sukhothai. The Khmer once again lost their hold on Thai provinces. Soon, the Thais emerged as the chief rivals of the Khmers, replacing their former enemies, the Chams. The Mongols under the leadership of General Sagatu also presented a threat to the Khmers, but the Khmer rulers were careful not to go to war against such a powerful force. Jayavarman VIII ascended to the Khmer throne in 1243. He was a Hindu rather than a Buddhist like his immediate predecessors. He was a violent anti-Buddhist and went on to destroy many Buddhist sculptures and converted the Bayon temple into a Hindu temple. His son-in-law, Srindravarman, who usurped his throne in 1295, was a Buddhist, though he was a follower of Theravada Buddhism. Later Khmer kings were adherents of this faith. The Thai Ayuttaya kingdom replaced the Sukothai kingdom in 1350 and succeeded in diminishing Khmer power through several attacks. By 1431 the Thais had conquered Angkor. Despite being weakened, a line of kings managed to rule from Angkor and a separate line of Khmer kings continued to rule in Phnom Penh. The latter line achieved more prominence because of the rise of Mekong as an important trade center, leading to the fall of Angkor.